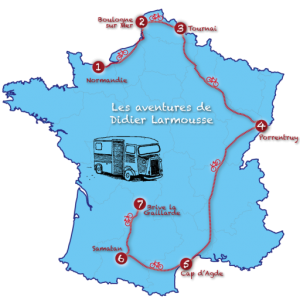 The Accueil page contains a navigation map showing Didier’s route around France. You can use this map to access any of the story chapters, grammar topics or exercises. You are in control, enjoy the ride! You can choose to read the whole story first, or move between story, grammar and exercises, in any order you choose. In the story chapters, useful vocabulary and phrases are highlighted in red – just roll over them to see a translation. Finally, if you want to find out about the FrenchGrammar.org team, ask a question, or get in touch, check out the À propos page. We’d love to hear from you!